I grew up two states south of Bill Nye, “The Science Guy,” and I less often considered sand on beaches than water molecules in the ocean, but I did spend many hours contemplating little things, real or imagined, awed by my relative enormity and, in turn, by my relationship to the greater, infinite expanse. Some professional scientists poo-poo Nye. If pressed, these scientists admit that their disregard is rooted in his popular appeal and his “dumbing down” of science for mass consumption. I prefer to celebrate Nye for the same reasons. My parents didn’t have a television when I was growing up, but when I visited a neighbor’s house and saw shows like "Sesame Street" or the "Electric Company," I was enthralled. 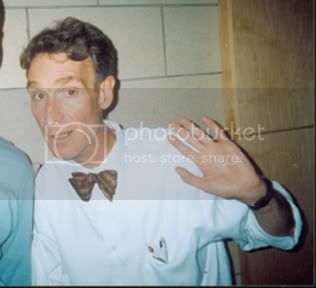 Had “Bill Nye, The Science Guy" been aired when I was young, I'm sure that I would have loved it, and I'm sure that he would have further inflamed my love of science. Interestingly, underneath Nye’s infectious excitement, he seems complicated. I find myself wondering what he thinks about after the studio lights are turned off. Is he defensively optimistic? Deeply pessimistic? What questions does he ask of himself? Of others? Does he avoid questions of personality or psychology, concentrating instead on that which he can safely externalize? Underneath all of his infectious excitement, then, Nye is something of a nihilist. Perhaps the lessons of science always reduce the human by presenting us relative to the rest of the mess. Maybe this, in part, contributes to the trend towards scientific specialization over generalism, allowing the scientist to avoid looking at the whole and thereby protecting her from potential crackup. Dude, you shore talk pretty. Seriously, though, I again applaud your appraisal of something I hold very close to my heart: the interaction between irony, genuine feeling, curiosity, passion, beauty, joy and goduniverseconsciousness (whatever it is you wanna call it). And constantly thinking about humanity and what it is to BE. Is it all pointless?? I dunno. Does it derserve careful thought, passionate inquiry and gleeful engagement??? Without a single solitary doubt in my mind. How can I reconcile those two equally important questions? Perhaps THAT is the question that gets me up in the morning and keeps gas in my engine. And those questions should give all of us gas. Um...keep us all gassed up. Hell, you know what I mean.